The administration just released its FY 2020 budget proposal, which seeks to cut domestic spending 5% below FY 2019. However, the proposed cuts are not made evenly across the board, as the administration is seeking increases for some programs – including $8.6 billion to complete the southern border wall, while making draconian cuts to other programming. Programs within the jurisdiction of the Labor-HHS-Education Subcommittee were particularly hard hit with HHS and Education programs each proposed to be cut by 12%, along with a 10% cut to DOL. Unfortunately, the administration also proposed to cut adult education by $156 million (24%) in their FY 2020 budget request. The good news is that the administration’s budget proposal was dead even before arriving on Capitol Hill today and key Congressional Members in both parties have indicated that they would like to negotiate a two year deal to raise the overall discretionary spending levels (or “caps"). Republican Members are particularly interested in making significant new investments in defense programs, while Democrats are pressing for more overall funding for domestic programs. Even if the administration’s budget proposal is not being taken seriously, it is a shot across the bow to adult education. We have been working for the past three months to educate Members of Congress about the importance of adult education funding in FY 2020 and this proposal only reinforces the importance of our collective effort this year. Please find attached a copy of the department’s FY 2020 budget proposal for key education programs. Thank you to those who have already submitted FY 2020 program requests to your Congressional delegations. Each Member has his/her own deadline for these requests by constituents, but many have set a deadline of either this Friday, March 8th or the following Friday, March 15th for submissions. As a result, if you have not sent in a program request, please do so now. You can find our draft template for your email here. After receiving your request, some offices will send a reply asking for you to submit a form they have developed in their office for this type of request. If you receive such a form, most of the information you need is contained in our template. Do the best you can to complete the remaining information. Don't be concerned if you can't answer all of the questions on their form; your Members of Congress will not reject your submission if it is incomplete. They are just trying to gain as much information as possible from you in examining which requests they intend to encourage the Appropriations Committee to support. While there is not a deadline yet in the Senate for FY 2020 program requests, it will be coming up soon, so the sooner the better in submitting requests to your Senators. President Trump just signed the FY 19 Labor-HHS bill which includes funding for adult education. It is first time this bill has been enacted before the end of the fiscal year on September 30th. This bill includes the additional $25 Million our field has been advocating for. Five of the twelve appropriations bills have now been enacted. The bill signed by the President today also contains the FY 19 Defense appropriations bill and a Continuing Resolution to keep federal agencies yet to be funded open through December 7, 2018. Congratulations to all who contacted their legislators through our Educate and Elevate campaign on behalf of Adult Education! Your hard work has paid off! House and Senate conferees completed negotiations on the Labor HHS appropriations bill today. The final appropriation amount for Adult Education is $641M for FY19, which represents a $25M increase over FY 18! This amount is in addition to the $35M that our field worked so hard for last year. The next step is a floor vote in the Senate next week, followed by a vote on the House floor the last week of September. The Labor-HHS bill is attached to the Defense Appropriations bill, which is a high priority in Congress to be enacted before the fiscal year ends on September 30th and the package will also include a Continuing Resolution to keep the remaining parts of the government open through December 7th. Hill insiders believe that the combined Labor-HHS/Defense bill will easily pass through the Senate and should also be approved in the House. Our advisors met today with House Labor-HHS Ranking Member Rosa DeLauro (D-CT), who believes the FY 19 Labor-HHS Appropriations bill will be enacted before the fiscal year expires on September 30th. DeLauro is one of the "gang of four", the key House and Senate appropriators tasked with the leading the negotiations on the Labor-HHS bill. She indicated progress in negotiating the bill has been incremental over the last few weeks, with the largest stumbling blocks being a host of policy riders in the House version of the bill, but not included in the Senate passed bipartisan bill. However, DeLauro was pleased the conferees have chosen to utilize the Senate's higher overall funding allocation, which is roughly $2 billion more than was allotted in the House bill, as it provides more flexibility for Members' priorities in their final negotiations. While DeLauro and her staff were initially concerned about the Labor-HHS being paired with the Defense Appropriations bill, they now view the two bills in tandem as a helpful tool to move the Labor-HHS bill to completion. Also, in public remarks yesterday, Speaker Ryan expressed his optimism about the chances for passage of the Labor-HHS bill and conservative members of the House seem largely resigned to having the Labor-HHS bill attached to the Defense bill in order to ensure swift passage of the Defense bill, which is their top priority among the appropriations bills this year. The wild card for enacting the Labor-HHS bill is whether the President will follow through on his threat to shut down the government unless adequate funding is first provided for a border wall --- but there is significant momentum to completing the Labor-HHS bill in a timely manner this year, which is in marked contrast to the FY 18 Labor-HHS bill, which was not completed until six months after the end of the fiscal year in March 2018. Adult Education and Literacy programs. For the first time in over a decade, the Senate has taken their version of the FY 19 Labor-HHS bill to the floor, with a host of amendments to be offered this week. Leadership officials expected to debate a host of floor amendments with the completion of the bill to occur sometime before Labor Day. The Labor-HHS bill has been attached to the FY 19 Defense Appropriations bill, which is the most popular of all of the appropriations bills, in order to give it additional leverage for passage. Pell Grants would be increased by $100 million. While significant progress is being made in the Senate, it is unclear when or if the FY 19 House Labor-HHS bill will move forward. The bill is flat-funded, with no more overall funding than in FY 18 --- which resulted in a highly partisan fight over funding in the full Appropriations Committee, with the bill passing without the support of any Democrats. Of particular interest to us, the House bill provides the Department of Education with a modest $43 million increase above current levels and the Department of Labor would be cut $82 million. While the Employment and Training Administration was reduced by $216 million, WIOA Title I formula programs would continue at FY 18 levels. Key education programs were largely funded at current levels including WIOA Title II Adult Education and Literacy programming and Pell Grants. However, the House bill does propose a $102 million increase for Career and Technical Education programs. At this point, it is questionable whether the House Labor-HHS will pass on the floor, unless some Democrats can be convinced to vote for the bill, which will be difficult without a significant increase in overall funding --- which is highly unlikely to occur, as a number of House conservatives oppose the bill in its current form. Regardless of whether we see any further movement of the Labor-HHS bill in the House, at some point, there will be a conference between the House and Senate to hammer out the details of a final FY 19 Labor-HHS appropriations bill. We do not expect that these negotiations will conclude until after the November elections, but unlike last year, where we had another six-month wait after the commencement of the fiscal year to finalize the appropriations bills, the FY 19 negotiations should wrap up rather soon after the elections. In the interim, we encourage your support for the Senate's $25 million increase for Adult Education and Literacy programs. Thousands of COABE members responded to our previous calls to action to support Senator Reed's CTE for All Act included in the bill, which will help working-age adults build their job skills and advance, with an emphasis on high-demand jobs. We are pleased to share that your outreach and collective voice helped bring about successful results for our field! Keep up the great work! Please read the press release below posted by Senator Reed's office. WASHINGTON, D.C. - Yesterday, Congress passed a bipartisan overhaul of the Carl D. Perkins Career and Technical Education (CTE) Act that includes key provisions authored by U.S. Senator Jack Reed to help working-age Americans build their skills and strengthen states' abilities to offer more career-technical or skills-based classes. The bipartisan package authorizes about $1.2 billion annually in federal funding for CTE related programs and will help give students at the secondary, adult, and postsecondary levels the skills they need to further their education and find good-paying, in-demand jobs. It will also help businesses find the skilled workers they need to compete in an evolving global economy. "There is no 'one size fits all' pathway to a successful career. But education leads to opportunity, and programs that blend basic skills and occupational training can help adult learners maximize their potential and increase their earning power," said Senator Reed, the lead author of the Career and Technical Education for Adult Learners Act (S. 3349, also known as the "CTE for ALL Act"), which was largely incorporated into the final, bipartisan package. "This bill takes a results-oriented approach to better aligning our education and workforce training initiatives with high-demand sectors. Students of all ages can benefit from career and technical education opportunities. Enhancing adult education helps American workers learn new skills and improve their lives. It can help lift individuals, communities, and businesses together because the more skilled workers who are out there earning a paycheck, the more demand there is for the goods and services our businesses offer." Encourage programs funded under the Carl D. Perkins Career and Technical Education Act to align with adult education programs and industry sector partnerships authorized under the Workforce Innovation and Opportunity Act. Include the state director of adult education and adult education providers in the development of the state plan for career and technical education. Enable adult education providers that also offer career and technical education programs to participate in consortia that are eligible to receive funds under the Carl D. Perkins Career and Technical Education Act. Expand the special populations to be served to include low-income, out-of-work, or underemployed adults. Place a greater emphasis on work experiences as part of career and technical education programs. The full U.S. Senate passed the bill yesterday and it was passed by voice vote in the U.S. House of Representatives this evening. The bill now goes to President Trump's desk to be signed into law. You may recall that as a field we rallied together for additional WIOA Title II funding, and received $35 million additional funding (the first increase of its kind in many years). There is an additional $25 million under consideration, but legislators need to hear from you as there are many competing priorities under consideration. If you believe your work in adult education is important, we urge you to take action today. It takes just a few minutes of your time and the increased funding will significantly impact the field. You can do so when you click the "Take Action" button. Additionally, if you are a local program administrator, please consider joining us for a one hour special online convening on July 17, 2018 at 2:00 p.m. EST aimed at equipping local administrators with hands-on advocacy tools. Contact advocacy@coabe.org to register. Note by COABE and NAEPDC: The changes would require approval from Congress, but it isn’t clear that lawmakers have the appetite to undertake a far-reaching reorganization, especially at this point in the year. With Congress set to consider Appropriations bills, immigration, and other contentious issues, there is virtually no time left on the Congressional schedule before the November midterm elections. During the Clinton Administration, Republicans proposed merging the departments of Education and Labor, and calling the new agency the Department of Education and Employment. That proposal failed. The House appropriations committee released information about the FY 2019 Labor-HHS-Education funding bill to be "marked up." The markup took place yesterday morning at 9:30 a.m. The markup session was webcast. You can view the session (which beings around 13:25 on the replay video). The bill increases funding for the Department of Education very slightly (by 0.1%), or $43 million over the FY 2018 level. The bill text does not include program funding levels, so it will be awhile before we know many details. We do know that the category Career, Technical, and Adult Education is funded at $1.945 billion, an increase of $115 million over FY 2018, but we don't know how the money is allocated between adult education and CTE. The bill does specify that spending on AEFLA National Activities be frozen at $13.7 million. Advocacy efforts have taken off! 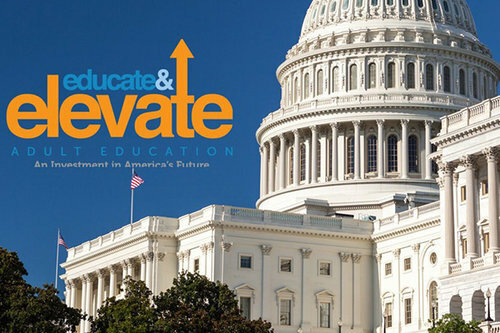 I am so excited to bring to you an update on the status of our adult education national campaign Educate and Elevate. WOW! We have come a very long way in a very short time, and we are not done yet by any means! You may ask national campaign - "Why now?" Notably, I and many of you have lived in the times when adult education had a diminished value, huge lack of understanding about what we really do, and tremendous budget issues year in and year out. We have all known for many years that our secret in adult education is a PROMISE to America. We prepare our students to compete in an increasingly competitive world and be as work-ready as possible. We empower individuals, families, and communities with the educational opportunities they need. We are the SOLUTION! We CAN make America more competitive, build stronger communities, and add to our tax base while containing costs. We CAN put adults on sustainable paths out of poverty and open up new avenues to financial security and the middle class. Given that, still you may ask, "Why Now?" Indeed, it's because America cannot continue to ignore millions of its residents who were never taught or never learned to read, perform simple math, use a computer, or creatively solve problems. IT'S OUR TIME FOLKS! Create processes for a concerted, collective effort to reach local, state, and federal officials and our communities. Inform and educate officials and the general public about the relevancy of adult education through data, stories, innovations, and key message points. Make specific requests to support funding adult education. Certainly, with all of this, you may ask yourself "How can I help?" 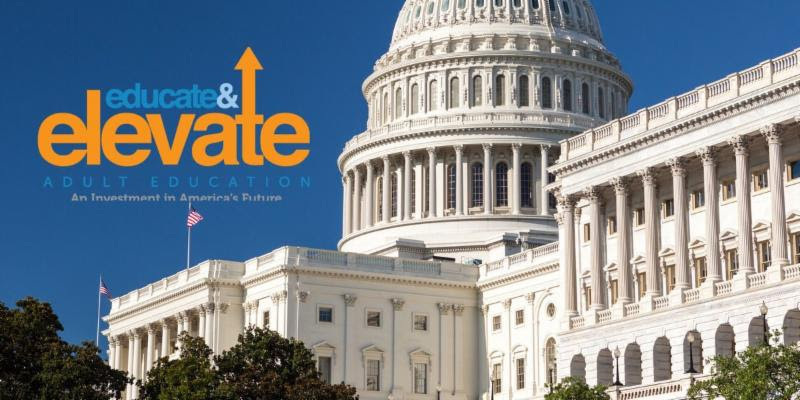 We, at COABE, ask that you share the campaign on your website, share the campaign via your email lists, submit innovations and success stories, let us know about your legislative meetings, read the Educate and Advocate eblasts we send out, and send us your ideas and comments. All of us need to STAND united with 55,000 plus adult educators across America to educate America about the importance of adult education in advancing career and college readiness for millions of people. The Coalition on Adult Basic Education submits this testimony to the Senate Subcommittee on Labor, Health and Human Services, Education, and Related Agencies to address funding levels in the Department of Education for Adult Education and Family Literacy. The Coalition on Adult Basic Education (COABE) appreciates the opportunity to submit testimony for the record about the funding level for adult education programs in FY 2019. COABE is a membership organization comprised of more than 55,000 educators, administrators, mentors, and guides working to improve educational outcomes for adults and build strong communities. COABE serves to promote adult education and literacy programs and other state, federal, and private programs that assist undereducated and/or disadvantaged adults to function effectively. While face to face meetings may take more time to plan and follow up, they are the most effective way to communicate. A great opportunity to meet with your federal legislator is during Congressional recess when legislators are in their home districts. Even if you are unable to schedule a meeting with your legislator due to scheduling conflicts, the LA ultimately advises the legislator on the vote and is the person who actually drafts legislative language for consideration by the committees in the Senate and House. LAs also have a high turnover rate as they advance quickly throughout their legislative careers. One never knows where he or she will end up; running an elections campaign, becoming head over an agency, or joining the staff at the White House. Meeting with the legislator, the LA, or the regional representative are all very effective approaches for educating the legislator on adult education issues. While one-to-one meetings can be very effective, it’s usually helpful to have a small group meet with the legislator, LA, or regional representative. Choose your group before scheduling the meeting.